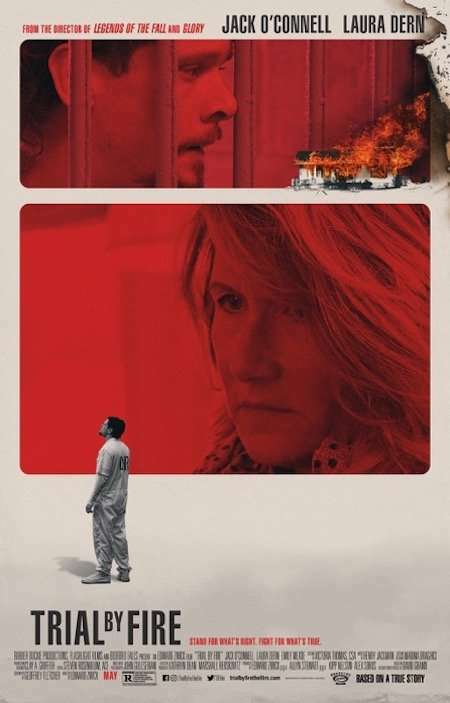 Trial By Fire is the true story of Cameron Todd Willingham (Jack O’Connell), a death row inmate who strikes up a friendship with a woman named Elizabeth Gilbert (Laura Dern). Willingham, who was convicted of an arson related triple homicide in 1992, spent 12 years on death row before his execution. The film explores Gilbert’s determined attempts to seek his freedom due to questionable methods and suppressed evidence that surrounded his case. Acclaimed filmmaker Edward Zwick (Courage Under Fire, The Last Samurai) directs the film which is based on The New Yorker article by David Grann and the letters of Cameron Todd Willingham. Trial By Fire opens nationwide May 17.